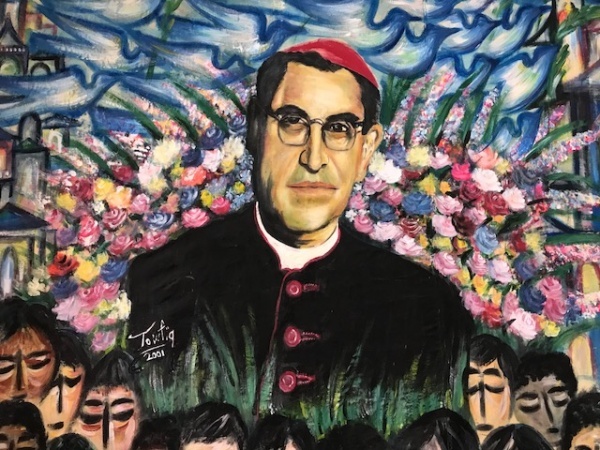 On Sunday 14 October, the Romero Multicultural Hub and the El Salvadoran communities in Brisbane had much to celebrate and rejoice about with the canonization of their patron, St Oscar Romero. The Romero Centre, which began in Rosalie in the mid-1990s as the Catholic Centre for Multicultural Pastoral Care, opened in Buranda in 2000 as a place of welcome and support for people; who were suffering the legacy of the Australian government’s mandatory indefinite detention and Temporary Protection Visas. In 2003 the Romero Centre came under the auspices of the Sisters of Mercy Brisbane and today continues as a vibrant outreach activity centre of Mercy Community Services SEQ Ltd providing free support for asylum seekers in Brisbane. The support provided includes emergency help, accommodation, legal expertise and connections, English classes, skills education, community events and more. Last Wednesday members of the Congregation Leadership Team joined ‘the people ‘of the Romero Centre - Maria, Veronica, Julie, Beata, Sarah, Deepa, Emili, Nancy, baby Teresa and many more for morning tea. We heard of their passion and dedication to the human spirit, shared stories about the early days of the Centre and recalled Oscar Romero’s challenge to Church leaders [of El Salvador] to speak out against poverty, social injustice, political assassinations and torture and his murder in 1980 as he celebrated Eucharist. We were so fortunate to meet Rosaria, a friend of Romero over 25 years who shared some of her first hand and treasured memories. ‘There are many things that can only be seen through eyes that have cried’ Oscar Romero and we were fortunate to share tears and laughter with people at Romero Multicultural Hub.